TransCanada is proposing a 1,700 mile pipeline, that would carry 900,000 barrels of Tar Sands oil from Hardisy, Alberta to Port Arthur, Texas. The pipeline system, worth USD 12 billion, is currently being built in order to link the growing supply of Canadian crude oil to the largest refining markets in the United States. The 36-inch diameter pipeline would connect to storage and distribution facilities at Cushing, a major crude oil marketing/refining and pipeline hub. The pipeline would go through six different states, and cross major rivers, including the Missouri River and the Red River. The giant oil corporations that have invested in the Canadian tar sands are hoping the Keystone XL will make oil extraction even more profitable. In fact, the aim is to double imports of dirty tar sands oil into the United States. 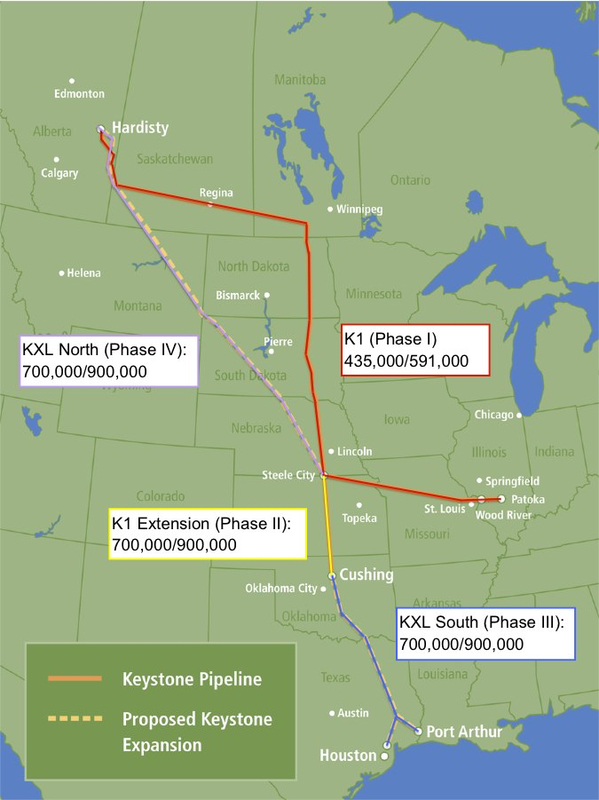 The Keystone XL pipeline construction consists of four phases of which phases 1 to 3a have been completed. Phases 3b and 4 are under construction. In Canada, the first phase of Keystone involved the conversion of approximately 864 kilometres (537 mi) of existing 36-inch (910 mm) natural gas pipeline in Saskatchewan and Manitoba to crude oil pipeline service. It also included approximately 373 kilometres (232 mi) of new 30-inch (760 mm) diameter pipeline, 16 pump stations and the Keystone Hardisty Terminal. The U.S. portion of the Keystone Pipeline included 1,744 kilometres (1,084 mi) of new, 30-inch (760 mm) diameter pipeline in North Dakota, South Dakota, Nebraska, Kansas, Missouri and Illinois. The pipeline has a minimum ground cover of 4 feet (1.2 m). It also involved construction of 23 pump stations and delivery facilities at Wood River and Patoka, Illinois. In 2011, the second phase of Keystone included a 480 kilometres (298 mi) extension from Steele City, Nebraska, to Cushing, Oklahoma, and 11 new pump stations to increase the capacity of the pipeline from 435,000 to 591,000 barrels per day (69,200 to 94,000 m3/d). Additional phases (III, completed in 2014, and IV, rejected in 2015) have been in construction or discussion since 2011. Private banks must not participate in funding this project, whatever form it takes, be it project finance, general corporate loans or underwriting of shares or bonds on the stock markets of the companies involved. The social impacts of the project concern mostly the surrounding local communities (both indigenous and non-indigenous). These implications range from health issues, destruction of local environment, contamination of water, implications on farm production, possible destruction on local indigenous artefacts, concerns for local economies in case of a leak in the pipeline, and much more. In 2007, Alberta's government approved the withdrawal of 119.5 billion gallons of water for tar sands extraction. An estimated 82% of this water comes from the Athabasca River. Toxic wastewater is discharged in holding or tailing ponds that now leak 11 million litres of toxic waste per day into the Athabasca and seep into the ground water. This water flows northward (downstream) further into Indigenous territories. Since this toxic waste has been flowing into the river and seeping into the groundwater, rare and virulent cancers have affected many of the Indigenous Community members, and fish and game have been found with physical abnormalities, deformations and tumors. This is also a concern for other communities along the path as the pipeline crosses large water reserves. If there was a leak there could be contamination in drinking water for millions of Americans and devastate the mid-western U.S. economy. There are various levels of concern for the environment, from the original stages of production, to the processing and transportation of the oil. The toxic waste run off has had detrimental effects on the surrounding environment. In short, the pipeline could pollute air and water supplies and harm migratory birds, fish, and other wildlife. The path of the pipeline crosses the Sandhills of Nebraska, which is the largest wetland ecosystem in the United States, as well as the Ogallala Aquifer, which is one of the largest reserves of fresh water in the world. Some of the pipeline will also cross an active earthquake zone with a magnitude of 4.3 as has happened in 2002. According to an article published in The Tyee, TransCanada applied to the U.S. government to use thinner steel and pump at higher pressures than normal. Meaning, a leak is not out of the question. At the same time, in order to expand production capacity in the Tar Sands, Exxon is seeking permission to haul 200 loads of equipment from Port of Lewiston, ID, along the LoLo Pass to Missoula, MT, with the final destination of the Tar Sands. These shipments are 24 feet wide, 30 feet tall, and up to 262 feet long, weighing up to 500,000 pounds. Many upgrades will be necessary to follow through with this plan as the current route runs through a delicate ecosystem on an unprepared roadway. These transformations would include relocating power and telephone lines, widening and strengthening banks, curves and the road base. As stated by Francois Paulette of the Smith's Landing Treaty 8 First Nation of the Northwest Territories: "White House policy makers need to know that their appetite for this dirty oil is killing our river and destroying our way of life. The pollutants and heavy metals don't stop at the Alberta border - they run more than 1,000 kilometres all the way to the Mackenzie River, deforming the fish along the way." There has been much opposition from indigenous groups from both Canada and the U.S. So much that groups from both countries have joined forces to oppose the project together. According to the Toronto star, there is almost unanimous opposition to the pipeline among tribal communities living close to the proposed pipeline's U.S. route. Amongst the various health and environmental concerns, another major concern is that the project will disrupt and/or destroy traditional native burial sites in the Sandhills region of Nebraska. Under U.S. law, any such disturbance disqualifies such sites from future inclusion in the National Historic Registry. Full article here. Judge Brian Morris levied what could be the final blow to TransCanada’s would-be Keystone XL tar sands pipeline, vacating the 2017 record of decision by President Trump to issue the Presidential Permit for the project. Judge Morris ruled that The State Department’s analysis of the following issues fell short of a “hard look” and requires a supplement to the 2014 SEIS in order to comply with its obligations under the National Environmental Policy Act (NEPA). The Court enjoins prohibits TransCanada from engaging in any activity in furtherance of the construction or operation of Keystone and associated facilities until the Department of State has completed a supplement to the 2014 Environmental Impact Statement that complies with the requirements of the National Environmental Policy Act and Administrative Procedure Act. Read more here. The U.S. State Department must conduct a new environmental review for the Keystone XL crude pipeline, a federal judge ruled. U.S. District Court Judge Brian Morris in Montana sided with indigenous and environmental groups in ruling Wednesday that a revised Keystone route is “interdependent” on the larger pipeline project and requires one environmental review (Bloomberg). The Keystone XL pipeline passed a major hurdle on Monday after Nebraska regulators approved the route for the project, which faced opposition from environmentalists and the Obama administration. The Nebraska Public Service Commission voted 3 to 2 to approve TransCanada's route for Nebraska's portion of the nearly 1,200-mile pipeline. However, the future of the project is still subject to the outcome of a likely legal battle (CNBC). President Donald Trump has approved the construction of the Keystone XL pipeline linking Canadian oil sands to U.S. refiners, a project blocked by former President Barack Obama. TransCanada said earlier in the day the U.S. Department of State had issued a presidential permit for the project (source CNBC). President Barack Obama has rejected the proposed Keystone XL pipeline, ending the political fight over the Canada-to-Texas project that has gone on for much of his presidency. Secretary of State John Kerry concluded the controversial project is not in the country's national security interest, and Obama announced from the White House that he agreed (source CNN). Recently, support for the project has been reaffirmed through a revised environmental study issued April 16th 2011 by the U.S. State Department. The draft EIS backs last years conclusion which claimed that the pipeline would have "limited adverse environmental impacts." A report released in February 2011 by the Department of Energy states that the pipeline, "could essentially eliminate Middle East crude imports longer term." A tentative decision date was given by the State Department for October 2011. On June 30, 2010, the commercial operation of the first phase of the Keystone pipeline was commenced by TransCanada. The first stage encompassed the conversion of natural gas pipeline to crude oil pipeline and a construction of a "bullet line" that brings the crude oil non-stop from Canada to market hubs in the U.S. Midwest. Before TransCanada can begin construction, however, the company needs a presidential permit from the Obama administration. According to a speech in an event she spoke at in October 2010, Secretary of State Hillary Clinton would still be inclined to support the Keystone XL mega pipeline. Full transcript here. President Obama's administration is currently considering the fate of the Keystone XL pipeline. These approvals are thought to encourage the supply of oil and halt the transition to clean and renewable energy. The project is expected to cost US$8 billion. $5 billion has already been secured via revolving credit to the pipeline business of TransCanada, the project's sponsor, from twenty-one financial institutions. The sum came in three loans that were each updated in December 2016. JP Morgan Chase and Bank of Montreal are the lead banks arranging the credit. For further information, see our profile on TransCanada Coporation. No to Keystone. Yes to Crazy. 2011-06-21 14:59:21 - Melina Laboucan-Massimo, a member of the Lubicon Cree First Nation and a Climate and Energy Campaigner with Greenpeace, describes the impact of oil and gas developments and the recent oil spill in the traditional territory of the Lubicon Cree in northern Alberta. 2011-02-01 15:29:06 - ExxonMobil has proposed building a high/wide corridor through some of the most pristine lands in Idaho and Montana. This new route would facilitate shipment of equipment manufactured in Korea to be used in the Alberta tar sands. 2011-02-01 15:24:12 - On February 18, 2010, the South Dakota Public Utilities Commission voted to approve Keystone XL pipeline. Get the facts. Will President Obama prevent the NEXT oil spill disaster? 2011-02-01 15:22:51 - President Obama pledged to learn the lessons of the BP Gulf oil spill disaster - and prevent future spills. The dirty tar sands oil Keystone XL pipeline is his chance to put his money where his mouth is. This website hosts a larger campaign to defund the companies building DAPL and all four tar sands crude oil pipelines proposed out of Canada: Keystone XL, Kinder Morgan’s TransMountain, Enbridge’s Line 3, and Energy East. Tell big banks: On December 15, say no to the Keystone XL pipeline!